DIANE is a character study starring character actress Mary Kay Place as a middle-aged widow in rural Massachusetts, who tries to help her adult son overcome substance abuse while doing things for other family members and longtime friends, and feeding the poor and needy at her church with her best friend. Mary Kay Place gives a touching, tour de force performance in DIANE, which contains some positive Christian content, but several of the story decisions by the writer/director ring a bit false, depressing and even pretentious, the movie contains many strong profanities, and a couple scenes mock the charismatic, Pentecostal church where the son finally finds refuge from his addiction. 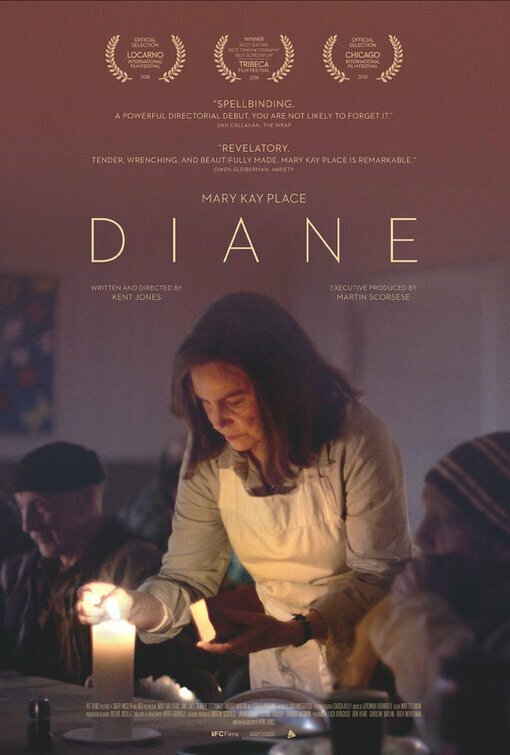 DIANE is a character study starring character actress Mary Kay Place as a middle-aged widow in rural Massachusetts, who tries to help her adult son overcome substance abuse while doing things for other family members and longtime friends, and feeding the poor and needy at her church with her best friend. Mary Kay Place gives a tour de force, touching performance in DIANE, which contains some positive Christian content, but several of the story decisions by the writer/director ring a bit false, depressing and pretentious, the movie contains a lot of foul language, and a couple scenes mock the charismatic, Pentecostal church where the son finally finds refuge from his addiction. In between serving food to the poor at her church and visiting her terminally ill cousin, Diane regularly visits her son, Brian, at his house, where he’s either sleeping or in a stupor. At first, Brian assures her he’s just sick and has some job prospects. Her nagging him to get more help despite a stint at a rehab clinic makes him angry. However, it soon becomes clear Brian is on another downward spiral. As Diane visits her cousin and other relatives and friends, the movie reveals that, about 20 years ago, Diane ran away with her cousin’s husband, an affair that didn’t end well. Now, Diane finds solace in doing things for other people, but the past keeps haunting her. Will Diane come to terms with her guilt? Will her son find the help he needs? DIANE features a wonderful performance by Mary Kay Place in the title role. She appears in every scene in the movie and deftly displays a wide range of emotions. In between her visits to the hospital, her son’s home, the church soup kitchen, visits to buffets with her best friend (who’s played by the delightful Andrea Martin), and visiting with friends and family to deliver some food or take part in some friendly get-together, Diane does a lot of driving here and there. Consequently, she doesn’t seem to stay in one place very long. DIANE contains more than several positive Christian references. In one of the most touching, Diane watches a black man she befriends pray earnestly and silently during his meal at her church. His quiet display of faith gives the movie one of its most uplifting moments. However, in one scene, her son Brian and his wife angrily badger her into joining the Pentecostal, charismatic church where they’ve found recovery. Diane adamantly rebuffs their efforts, saying she prefers her own church. Later, in another scene, Brian comes to visit his mother at her home and apologizes for his behavior. It’s another touching scene where they lovingly forgive one another, but at the end of the scene, Brian flippantly says, “Back to Jesus world,” as he walks out the door. So, what’s the purpose of that line? Do the filmmakers not think Diane’s own church preaches Jesus? Sure enough, after Brian leaves, Diane goes to bed and next to her bed is a small Crucifix of Jesus being crucified. Taken together, these two scenes don’t ring quite true. In the dinner scene especially, the reasons Diane’s son and his wife give to convince Diane to join their church don’t seem very Pentecostal. They don’t mention Jesus or the Holy Spirit, and give no Bible verses for Diane to consider, something which would seem pretty likely in such a situation. In the end, though Diane is depicted as a caring person who loves helping the poor people at her church, her Christian faith takes a backseat in her personal life. As a result, the movie’s last scene is rather depressing and unsatisfying. It’s also anticlimactic. While it may be true that life doesn’t always resolve every problem in a neat, tidy, happy, pretty little bow, the joys and beauty of life, whether you believe in God or not, can be quite wonderful. Perhaps Kent Jones, the creator behind DIANE, suffers from the problem to which many modern filmmakers (and artists) succumb, a fear of leaving audiences with something positive or edifying as they leave the theater. He says his movie is based on older people he knew in his life back in Massachusetts. If that’s true, it’s really sad, then, that the movie’s happy moments are often drowned out by tragedy, sickness and death. What a gloomy view! DIANE should have ended with the scene of forgiveness between Diane and her son. Biblical passages like this one give us bright rays of hope. For the Divine Light of Jesus shines in the darkness, and the darkness has not overcome it (John 1:5). DIANE also contains a lot of foul language, including many strong profanities. There’s also a scene where Diane’s guilt about her past drives her to find refuge in a local bar, where she tries to drink away her sorrows alone. Finally, there are multiple references to substance abuse, but recovery from substance abuse is commended. If the ending were more hopeful and/or redemptive, DIANE would have been significantly improved. The movie also gets bogged down in the details of the heroine’s errands, which end up clouding her mind in a tragic way that’s depressing. All the foul language doesn’t help. Ultimately, therefore, DIANE is too annoying, excessive and unacceptable. Woman appears to be wracked by guilt but never turns to God or Jesus or even other people for help. DIANE is a character study starring character actress Mary Kay Place as a middle-aged widow in rural Massachusetts. Diane tries to help her adult son overcome substance abuse while doing things for other family members and longtime friends. She feeds the poor and needy at her church with her best friend while regularly visiting her terminally ill cousin in the hospital. Eventually, the movie reveals Diane is wracked by guilt over a sin she committed years ago. Will Diane come to terms with her guilt? Will her son find the help he needs? DIANE features a wonderful performance by Mary Kay Place. She appears in every scene and displays a wide range of emotions. DIANE contains more than several positive Christian references. However, Diane never turns to Jesus, or even other people, for help with her problems. The movie’s positive Christian content is undermined by some mixed content, including many strong profanities and a negative portrayal of a couple Pentecostal churchgoers who don’t fit in with Diane’s Christian faith. Finally, the ending in DIANE is a bit depressing and anticlimactic.